I’ve seen advertisements for Squarespace, so I’m guessing you may have too. It’s an enticing option for an individual or small business looking to launch a new website. Myself, I’ve always worked with WordPress. I use it for my clients and my own websites. I did a little surface level research to see if there’s any reason why I’d recommend Squarespace instead of WordPress. It turns out there’s no such reason. WordPress wins the battle, in my opinion, and here’s why. 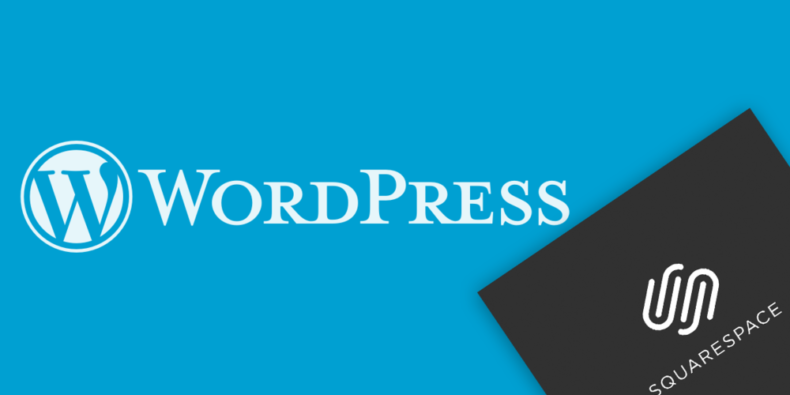 WordPress lets you download their platform for free. You can install it anywhere you want, as many times as you want. The benefit to this is that you can choose your hosting company. I use and recommend SiteGround WordPress Hosting. Squarespace restricts you to their own servers, and won’t allow you to move your site if you want to. WordPress currently powers over 27% of ALL websites. That’s millions of websites! This, and the fact that WordPress is open source has lead to an enormous community of developers, designers, and support forums. With all these resources, you can find help with your specific problem, or easily find a developer to work on your website. Squarespace powers significantly less of the web, and there are fewer developers available to customize their templates. WordPress has no claim over your content. However, Squarespace, according to their Terms of Service, statements 2.2 and 2.3, can use any part of your site for things such as advertising, even if your content is copyrighted. When you sign up on Squarespace, you consent to this and agree to let them use anything they want, for free. WordPress has spawned over 49,000 plugins from developers all over the world. Each one is available for free on the WordPress plugin repository. You can find nearly any feature you want for your website in a plugin. This includes SEO, e-commerce, and so much more. With Squarespace, what you see is what you get. And there’s not much you can do about it. WordPress offers a huge number of themes on their repository for you to choose from and install for free. This is amazing if you’re trying to launch your own website quickly and at little cost. If you want to take things further, there are plenty of amazing paid themes you can buy for a nominal cost, which will take your website to the next level. Squarespace currently has just over 50 templates to choose from. WordPress powers some pretty huge company’s websites and blogs. Companies like Sony Music, BBC America, and The New Yorker have made it clear they trust the platform and it’s flexible enough to fit any need. Squarespace markets themselves in a way that targets creative individuals such as photographers and designers, or small product sellers. All of whom would get a whole lot more out of the box if they used WordPress. It really comes down to features, flexibility, and cost. In my opinion you can get far more mileage and bang for your bug from a self hosted WordPress website. I do see the appeal of Squarespace for those DIY customers who want a very low barrier of entry for their personal or small business website. But down the road they’re bound to need some features that just aren’t available with Squarespace. Start off with WordPress and you’ll go far. Have you used either platform?